(Psychedelia by the beach) 5th Anniversary. That its just a taste of what will be waiting you on 30 of August at our big project in Saranda,Lukove. 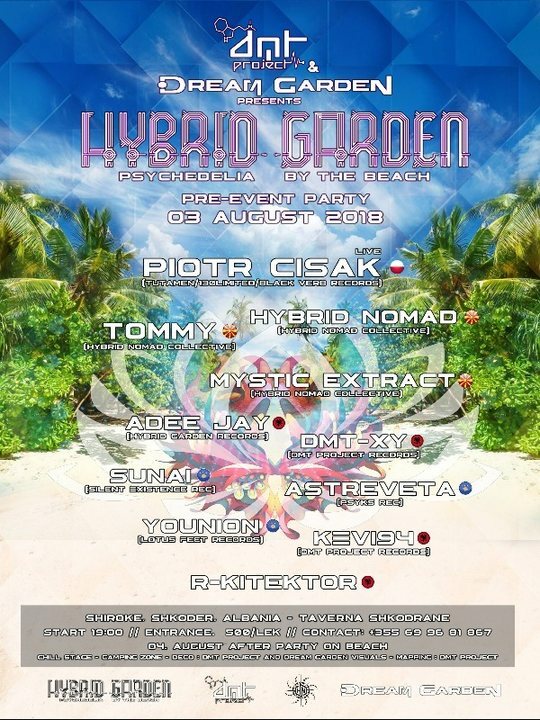 This event its a tribute of the Festival Hybrid Garden Gathering of the Tribes (Psychedelia by the beach) 5th Anniversary on 30/August/2018 . probably because you are as excited as we are about the next edition !!! We are looking forward to a magical weekend with you! A weekend during which we want to create so much joy that there will plenty for you to take home with you from the party site, to spread and to share! DMT Project & Dream Garden are getting warm this month of August preparing you for our next event that will take place in Saranda, 4 days of paradise on earth !!! This event its just a lite puzzle of our master project of 30 August (Psychedelia by the beach) !!! Before the magic of Saranda,in Lukova we thought to create one pre-party of the festival in this way to give a small idea to the people of what we do !!! We want to change the world with our art and our music!!! Located into a virgin place where your soul become one with the nature under the amazing different style of electronic music, we will bring you to another level !!! You all know what that means and if you don't make sure you come and check it out. Shiroke,Shkoder,Albania Located on the lake near the water and completly virgin place.We promisse to you Heaven on earth with the best Underground Quality Artists and amazing vibe .